We are pleased to offer for sale this 90% Silver Dollar Modern Commemorative. You will receive one Modern Commemorative Silver Dollar picked randomly by us. Your Silver Dollar will be one of the US Mint's Commemorative Dollars issued from 1983-2015 in either Proof or BU (Brilliant Uncirculated) condition. These coins are 90% Silver Dollars that contain .773 troy ounce of silver. The coins are 38.1mm in diameter and come in a capsule. Some of the coins do have light marks, toning or oxidation but at this price it is a great way to pick up a 90% Silver Dollar or start your Commemorative Dollar Collection. 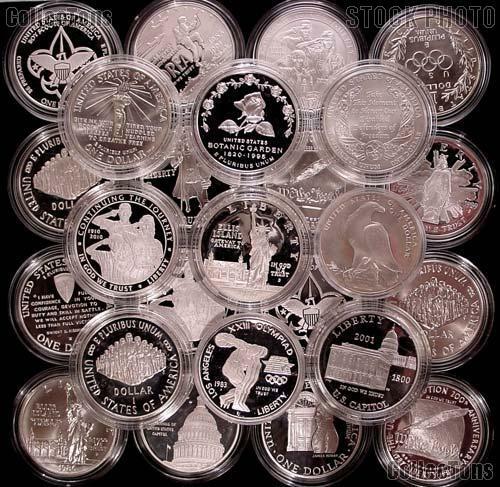 Don't miss your chance to grab one of these Silver Dollars at this blowout price!